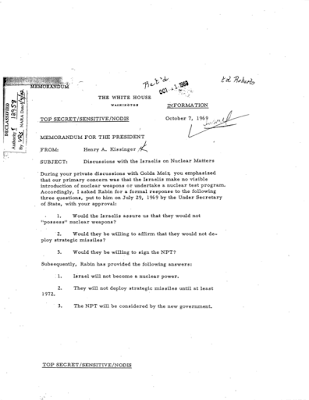 In the first part of this two part posting, I looked at the early history of Israel's nuclear/nuclear weapons program, outlining France's participation in the project and how Israel's leadership clearly lied to the United States about the nation's plans for a nuclear weapons future. 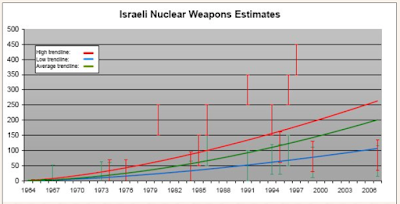 In the second part of this posting, I want to look at the later years of Israel's highly secretive nuclear chronology as well as estimates regarding the nation's inventory of nuclear weapons. 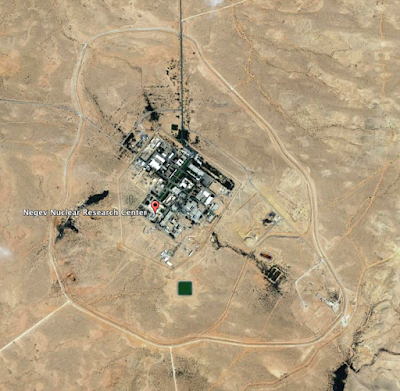 In December 1963, Israel's Dimona reactor aka the Negev Nuclear Research Center, located in the Negev Desert, went into operation, a plant that was largely designed with the assistance of the French government. Back in January 1962, then-Israeli Prime Minister David Ben Gurion informed the Knesset that the Dimona complex was not a textile mill (as you will have read in the first part of this posting) or pumping station, rather, it was a "scientific institute for research in problems of arid zones and desert flora and fauna". Once it was revealed that Dimona was, in fact, a nuclear research facility, Israel and the United States arranged for American scientists to visit the Dimona complex with the goal of reassuring the American government that nuclear weapons research was not taking place. In early 1964, American scientists on a prearranged inspection tour of the Dinoma complex learn that the reactor went critical on December 26, 1963. By 1965, the facility is under extreme levels of protection; over half of the 50 HAWK missiles that Israel received from the United States are reportedly positioned around the Dimona complex. In 1966, French nuclear officials announce that Israel is capable of producing weapons-grade fissile material with the first plutonium extraction tests taking place during the second half of 1965 and that Israel had sufficient plutonium to manufacture a nuclear weapon during 1966 or early 1967. Despite repeated pronouncements by Israeli politicians that Israel will not be the first nation in the Middle East to introduce nuclear weapons, some Western sources state that Israel conducted an underground nuclear test at Al-Naqab in the Negev Desert. In 1967, French sources announce that Israel sent France 40 tons of Dimona's spent plutonium-rich fuel which French technicians separated, returning about half or an amount sufficient for 15 to 20 bombs to Israel. In May 1967, according to a former Israeli government official, Israel assembled two nuclear bombs ten days before the outbreak of the Six Day War. In June 1967, Israeli Prime Minister Levi Eshkol orders that both Israeli nuclear warheads be armed during the nation's first nuclear alert. In early 1968, the CIA reported that Israel had successfully produced four nuclear weapons. On July 12, 1969, American scientists visit the Dimona complex for the last time; the annual inspection visits had been arranged under a 1963 agreement between President John Kennedy and Prime Minister Levi Eshkol. The American inspection team complained that the Israelis did not permit them to move freely about the Dimona complex and that they could not guarantee that no nuclear weapons-related work was being done at Dimona. 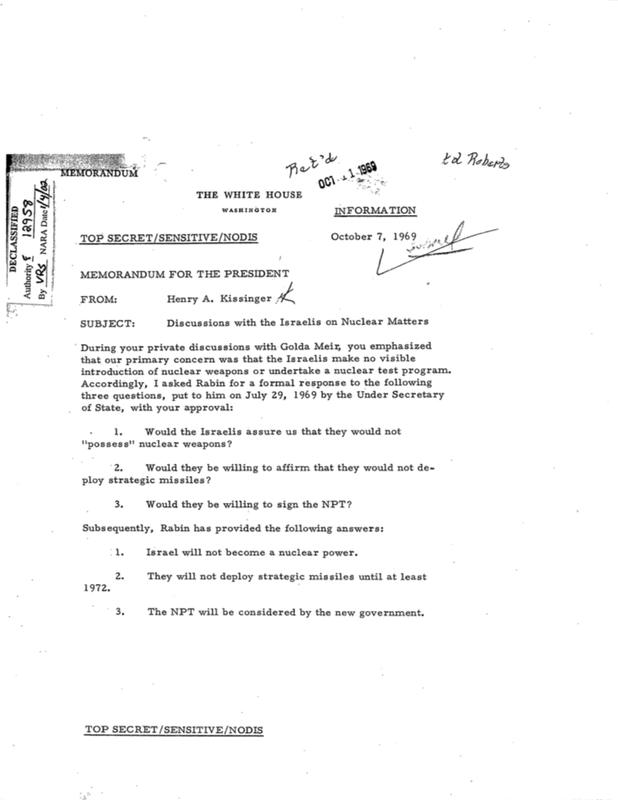 Interestingly, in February 1970, Israeli Ambassador Rabin informed Henry Kissinger that Israel had no intention to sign the Nuclear Non-Proliferation Treaty, a pledge that they have stuck to for nearly 50 years. You can very clearly see the protected perimeter of this "textile mill/pumping station" in both photos. 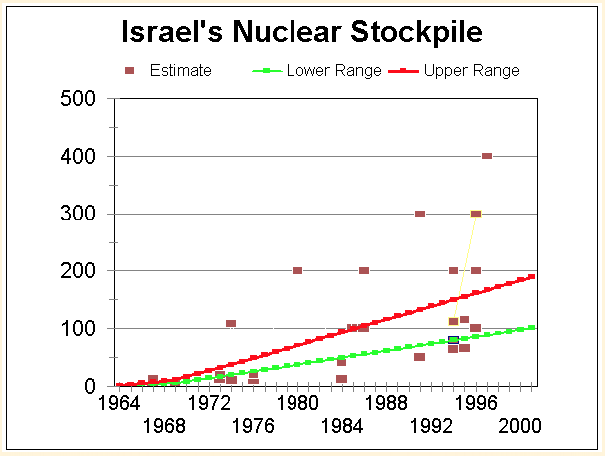 "The upper and lower plausible limits on Israel's stockpile may be bounded by considering several variables, several of which are generic to any nuclear weapons program. The reactor may have operated an average of between 200 and 300 days annually, and produced approximately 0.9 to 1.0 grams of plutonium for each thermal megawatt day. 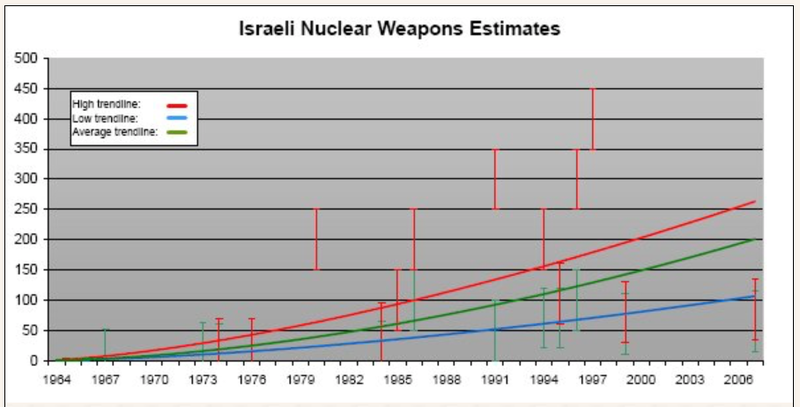 Israel may use between 4 and 5 kilograms of plutonium per weapon [5 kilograms is a conservative estimate, and Vanunu reported that Israeli weapons used 4 kg]. 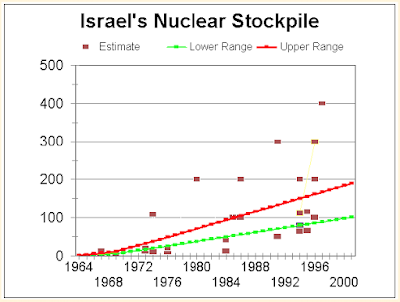 The key variable that is specific to Israel is the power level of the reactor, which is variously reported to be at least 75 MWt and possibly as high as 200 MWt. New high-resolution satellite imagery provides important insight this matter. The imagery of the Dimona nuclear reactor was acquired by the Public Eye Project of the Federation of American Scientists from Space Imaging Corporation's IKONOS satellite. The cooling towers associated with the Dimona reactor are clearly visible and identifiable in satellite imagery. 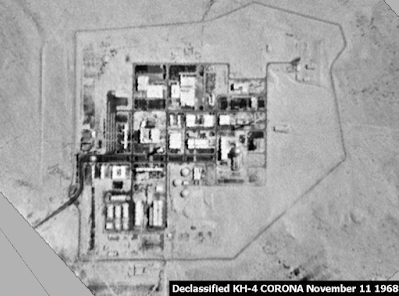 Comparison of recently acquired commercial IKONOS imagery with declassified American CORONA reconnaissance satellite imagery indicates that no new cooling towers were constructed in the years between 1971 and 2000. This strongly suggests that the reactor's power level has not been increased significantly during this period. This would suggest an annual production rate of plutonium of about 20 kilograms." With that information in mind, let's close this posting. From these two postings, one thing becomes very clear; there is a double standard in Washington when it comes to states other than the United States, the United Kingdom, France, Russia and China and their potential development of nuclear weapons. Just as it is apparent that Israel has acquired a significant number of nuclear warheads, it is clear that Israel has a long history of both hiding and lying about its nuclear arsenal. The nation's refusal to sign the Treaty on the Non-Proliferation of Nuclear Weapons or NPT makes the nation a standout with such pariah nations as North Korea.